This house on the corner of Steiner and Broadway in San Francisco was used for exterior shots of the home in the film "Mrs. Doubtfire." The iconic "Mrs. Doubtfire House" in San Francisco may soon hit the market, according to SocketSite, a website covering real estate in the city. The home, which has yet to be listed for sale, sits at 2650 Steiner Street in Pacific Heights. SocketSite reports the home "last traded hands for $1.395 million in 1997." The home made headlines in January 2015 when the door was set ablaze by an arsonist. 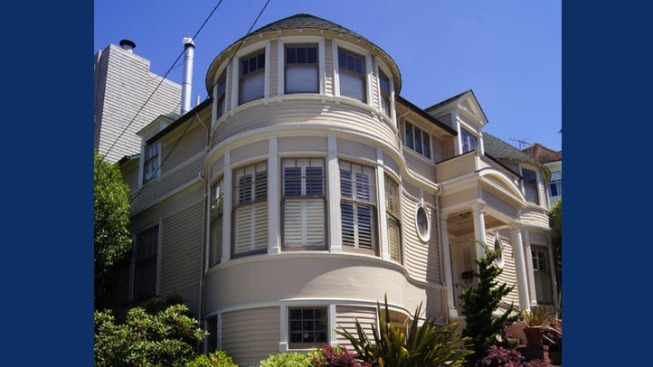 The "Mrs. Doubtfire House" also served as a temporary shrine to Bay Area actor Robin Williams, who starred in the 1993 movie, after he committed suicide in August 2014.